Two great Hobbit movies (and that other one) for $38 - grab it while you can! If you're looking to complete your Middle Earth movie collection, this is the deal for you. 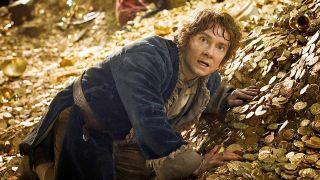 Yes, The Hobbit trilogy isn't as good as The Lord of the Rings, but you have to have them all, don't you? And An Unexpected Journey and The Desolation of Smaug were pretty good... sort of. Just think of The Battle of the Five Armies as a bonus (or don't think about it at all). At least you can get a good deal on them thanks to Cyber Monday. Amazon have a whopping 62% discount on the Extended Edition of The Hobbit trilogy on Blu-ray (originally $99.98) meaning you can snap it up for less than $40, which is much more appealing than dropping nearly $100 on it, right? Hobbit: The Motion Picture Trilogy Extended Edition on Blu-ray for $38.49 (was $99.98): Complete your collection by snapping up this Extended Edition of The Hobbit films on Blu-ray with a 62% discount at Amazon. If you're in the UK, don't despair. Amazon UK also has a deal on The Hobbit trilogy on Blu-ray (although it's not the Extended Edition), and it's only £10.49 so you can feel even better about getting it. And if you need The Lord of the Rings trilogy too - call yourself a Middle Earth fan?! - there's a Cyber Monday discount on that as well thanks to Amazon. Make sure you check out the best Cyber Monday entertainment deals for more offers on Blu-rays and DVDs, as well as 4K televisions, headphones, and more.